“Comeback” is the right way to describe the CLO market this year (Collateralised Loan Obligations – securitised portfolios of predominantly senior secured leveraged loans). Led by the US CLO market, we have seen global issuance YTD in 2014 of a staggering $101.5bn*. 88.5% of this has been issued in the US and 11.5% in Europe. Estimates for full year 2014 issuance ranges from $110.0-125.0bn and €10.0-15.0bn for the US and European markets respectively; an all-time record if achieved. 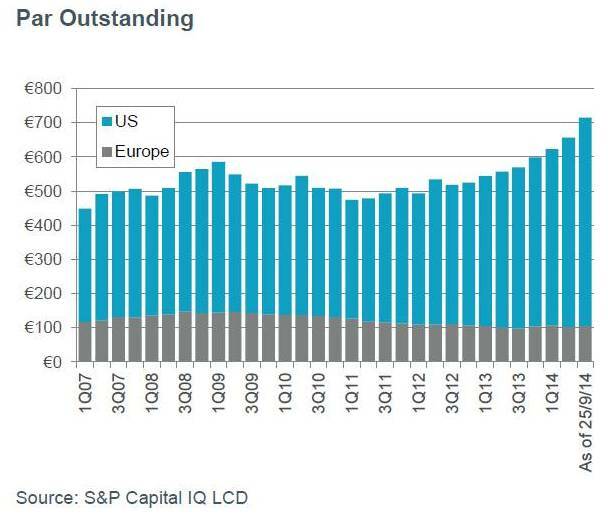 The US CLO recommenced new issuance activity in late 2011/early 2012 well ahead of the restart of the European market. The European market’s delay can best be explained by uncertainty around new regulations and in particular the constraints imposed on managers of European CLOs by the Committee of European Banking Supervisors (CEBS). The now implemented Capital Requirements Directive has introduced the requirement that risk retention be held by the CLO manager or an “originator” of the transaction. Managers of the new vintage of European CLOs (also known as “CLO 2.0”) are therefore usually obliged to own 5% of the CLO from inception to the time of unwind. The most commonly used risk retention is for the manager to own 5% as a vertical slice of the whole structure on their own balance sheet which is intended to align the interests of the manager and investors across the structure. But as is the case with many other rules people are exploring alternative methods of compliance. In the case of the European CLOs we are starting to see this through use of “originator” alternatives. On the other hand, the US CLO market, where individual CLOs in excess of $1bn have begun to appear, has until now been less constrained by new regulation. That is now changing though, with the implementation of the Volker rule, the wider Dodd Frank regime and risk retention requirements. The heightened CLO issuance activity across both markets has had a very positive impact on the senior secured leveraged loan market (the term used within ECM for these types of loans is Senior Secured Loans which forms our primary focus in the sub-investment grade loan asset class). 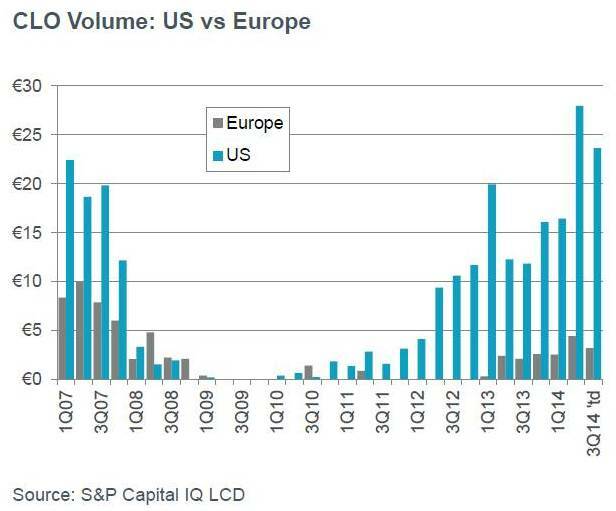 New issue volumes are heading towards post-crisis record levels in both markets which is helped not only by the CLO activity but also the general increase in M&A activity and private equity’s ability to continue to raise funds (the so called PE “dry powder” in Europe currently stands at € 225.0bn*). CLOs’ involvement in the leveraged loans market provides a strong long term investor base which will help keep volatility at low levels. 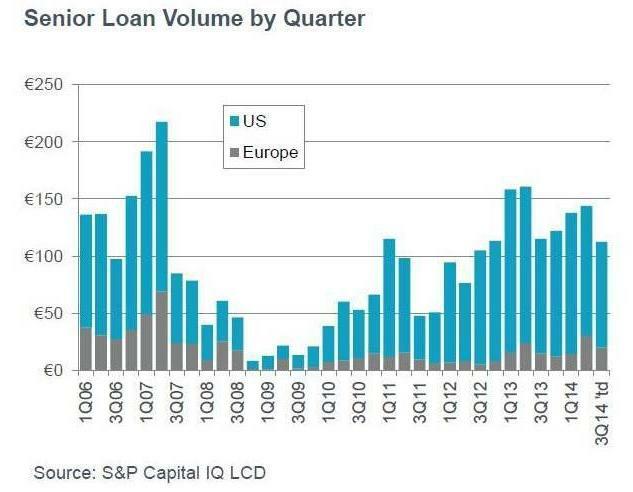 As the European leveraged loans market is purely an institutional market, the involvement from CLOs is important – continued development and issuance will provide further pivotal support for the growing European leveraged loans investor base. The US leveraged loans market on the other hand has over the last couple of years had large inflows from retail investors (through mutual funds, ETFs etc. which all offer daily liquidity). With these “new” entrants, the US market has seen increased volatility and the risk of higher volatility is a major difference between the two markets. Back in June this year we saw the first impact from such volatility created from retail investors withdrawing assets from daily liquidity funds. We saw prices drop 0.5-1.5 points and new issues had to adjust their opening terms to reflect this supply in the secondary market. The wobble was, however, short-lived as most of the paper that came to the secondary market was bought by CLOs (specifically warehouses which gather loan assets in preparation for CLOs). This highlighted the importance of CLOs in the US providing a more stable investor base to help balance out supply and demand and importantly the quantity of CLOs issued in the US this year far outstrips the outflows from retail funds. With increased expectations of upward moves in interest rates, even with the potential of divergence and potential earlier moves in the US and UK than mainland Europe, both the leveraged loans market and the CLO market in both the US and Europe should offer attractive levels of returns with the benefit of floating rates as an embedded feature. With their unique investor bases, structures and regulatory frameworks both the European and US markets offer attractive opportunities in today’s credit markets, individually or in combination. One element is certain CLO managers globally will be competing for the blessing of investors to look after their long term investments.